Nobody wants to be stuck slaving over a hot stove on Thanksgiving, running around like a headless turkey while hundreds of pots and pans pile up on the counter. After all, chopping the Mount Everest of vegetables while the gravy is burning on the stove isn’t our idea of holiday fun. However, this nightmare doesn’t have to become a reality, which is why we’re here to help. 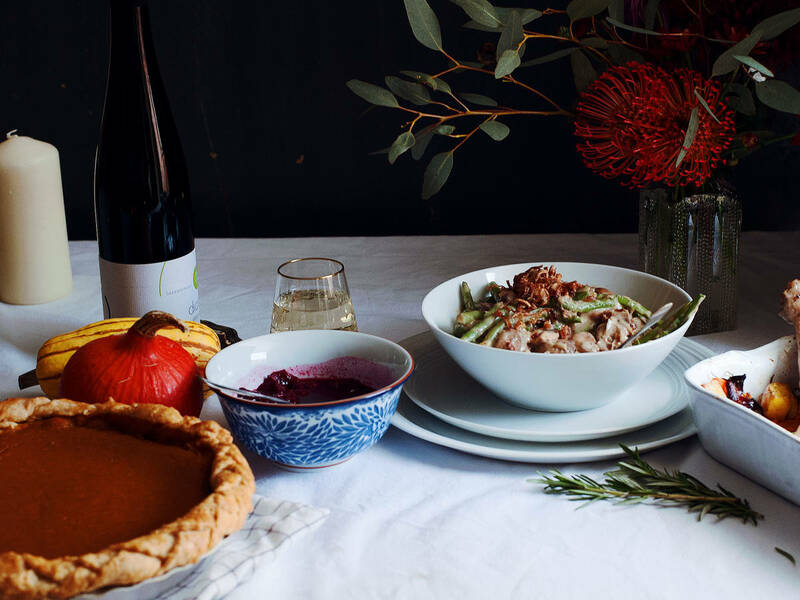 With a bit of planning and savvy preparation, it’s easy to achieve all your Thanksgiving ideals without any severe kitchen disasters. First things first, a few weeks before Thanksgiving you should do a stock check of your freezer and cupboards, then proceed to get rid of everything you don’t need. After the ousting of the old and expired, it’s in with your new, organized fridge-freezer system. Organize purchasing your frozen ingredients when the stores will still be quiet and you won’t have to jostle through the crowded aisles with your shopping cart. Frozen fruit and vegetables are always a good purchase, so grab the green beans that you’ll need for your green bean casserole and the cranberries you’ll need for your own homemade cranberry sauce. Purchase your fresh produce a few days before the big day, and then take a look at our Knife Skills How Tos. Wash, peel and chop everything you possibly can when you get home, then store it in labeled airtight containers in the fridge, to save time on prep work on the actual day. You’d be amazed at how much you can freeze in advance to cut down on your effort in the kitchen. Get your apron out the weekend before Thanksgiving, put on the radio, and prepare everything you possibly can: make all your fresh stocks, cranberry sauce, some mushroom soup, and of course an American apple pie. Freeze the stocks, soup, and sauces in airtight containers and wrap the unbaked apple pie tightly in foil before freezing. Now you’ll only have to worry about defrosting everything the night before and warming it on the actual day. The key to a stress-free Thanksgiving always includes a plan, so get your notepad ready. The Night Before: Defrost everything in the refrigerator so that you’ll be ready to start first thing in the morning! Morning : Start to roast the turkey as soon as you get up, the delicious smell wafting up the stairs will definitely encourage everyone else at home to come and give you a hand in the kitchen! Then get on with the most time intensive dishes so as to make things easier for yourself in the afternoon. Roll up your sleeves, mash your potatoes, bake your pre-made pies and casseroles and set the table. You can also place the casseroles, soups and mash in slow cookers to keep them warm so you won’t need to reheat them later. Early Afternoon: Why not make our seasonal wheat beer punch and put it in the fridge to chill so that it’s ready for your guests’ arrival? You can also make your gravy now, and pour it into a thermos to keep it hot before pouring it into a gravy boat for the table. And last but not least, it’s the time to carve the turkey and get ready to plate your feast. The most important thing to remember about Thanksgiving is that it should be spent enjoying time with loved ones, not being trapped in the kitchen and exhausting yourself for the entire day. It’s definitely worth doing some preparation a few days before, so that you can maximize your family time. What’s more, by preparing everything early then it will probably taste better than if you were rushing everything on the same day. Happy Thanksgiving, and enjoy your meal! You deserve it.